This guide offers an in-depth analysis of the current cryptocurrency market. We will take a broad approach on economic aspects and evaluate the actual market sentiment. Furthermore, we will have a glance back in the past and explain the use of specific trading tools and how to apply them correctly. 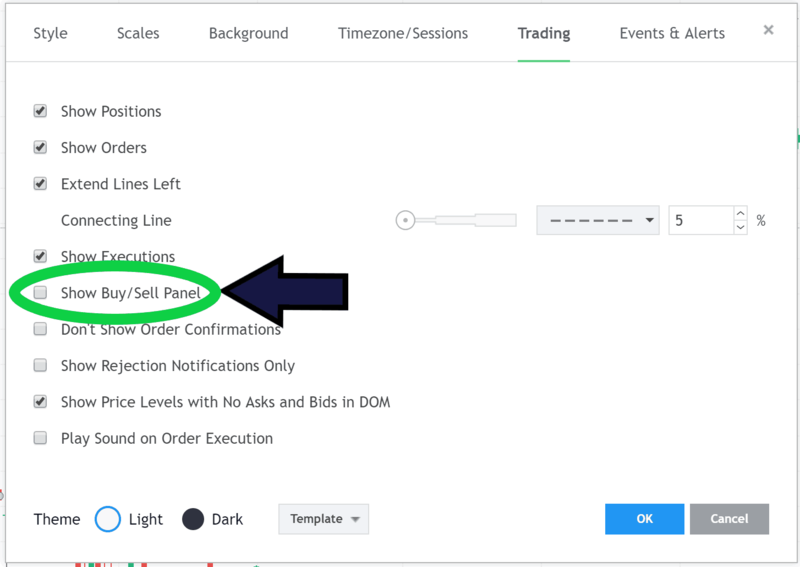 Additionally, we gonna provide complete guidance on how to set up your own trading charts with respective indicators on TradingView.com. The basic principle of supply and demand is essential to fully understand market movements. This very basic economic law is driving markets and ultimately determines the value of every asset. The ratio between both factors has a direct impact on the price behavior. We first have a look at Bitcoin. Approximately 17.3 million Bitcoins are currently in circulation. This signifies in effect that the current Bitcoin supply currently equals to 17.3 million. If we compare this number with the e.g. Ripple, the third biggest cryptocurrency, in terms of market capitalization, we note an astonishing 40 billion coins difference in supply. Now, imagine how much demand it needs to make every of this 40 billion coins of Ripple just to rise for a few cents while low-supply cryptocurrencies like Bitcoin eventually shoot up in price even if the demand remains relatively low. Remember that this is only one of many factors you while examining a potential investment but definitely an important one. New entrants often rate a cryptocurrencies’ attractiveness due to its price. Instead, the market capitalization is the decisive parameter. (Bitcoin’s market capitalization) : (market capitalization of your cryptocurrency) = The potential multipliers of your investment at present prices. 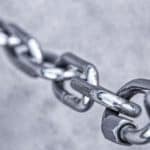 Back in December 2017, decentralized payment systems and Blockchain-based solutions were the newest hit. The overall market perception during this period was extremely positive or in other words “bullish”. A bull market is characterized by extensive price increases and typically accompanied by high media coverage, hype, and greed of investors. 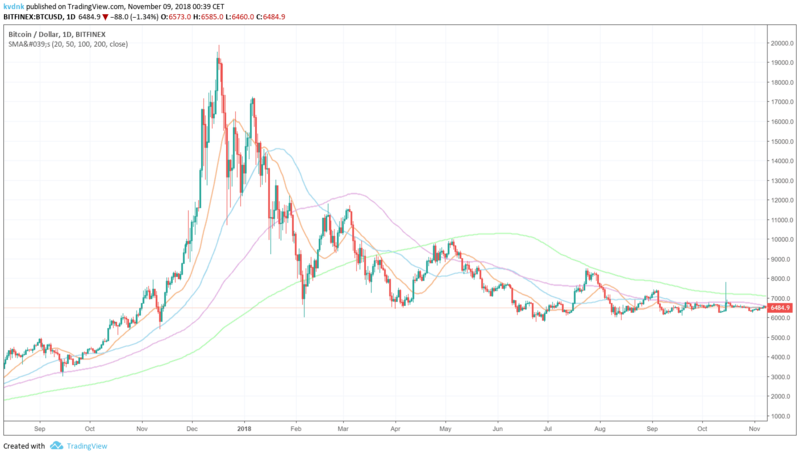 During bull periods, lots of inexperienced investors are entering the space, all together with unrealistic expectations based on major price increases in the past. The majority of them simply want to make a quick buck overnight. After the price of Bitcoin peaked on the 17th of December in 2017 the market sentiment slowly begun to reverse. Smart money cashed-out, following minor price drops. This led to big sell-offs from short-term investors and weak hands. The bubble has ultimately burst, leading into a bear market characterized by falling prices, negative publicity, and investor depressions. This screenshot from Google Trends indicates the interest in Bitcoin. The convergence of the general public‘s interest in Bitcoin and its price is staggering. Both interest and price peaked on the exact same day in December 2017. If you want to become a sophisticated trader you have to get along with certain trading indicators explained later in this blog. Furthermore, your expectations should always stay realistic. No cryptocurrency nor security will rise forever in a straight line no matter what the media and experts might say. On the way up there will always be inevitable and necessary corrections. History repeats itself again and again. The traditional stock market has produced evidence of the theory of cycling markets. 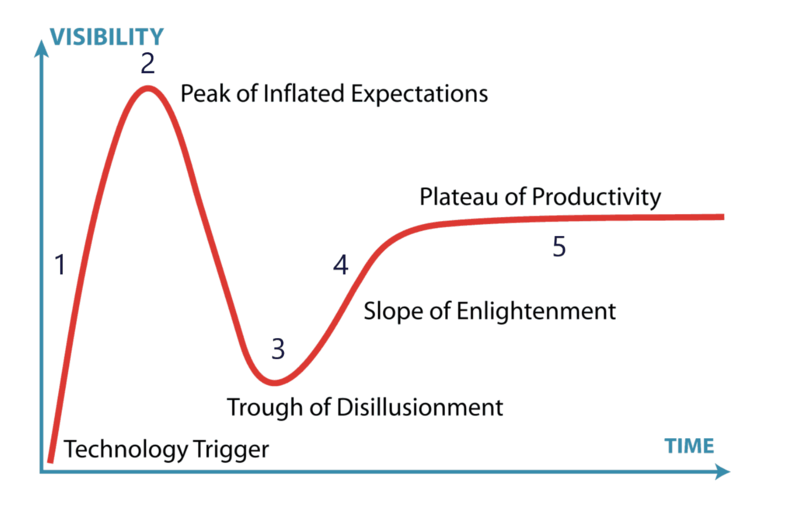 As we focus on cryptocurrencies we’ll look at the five cycles disruptive technologies had to traverse in the past. The start of every bubble is the invention of something new and groundbreaking. New revolutionary technologies like the internet or Bitcoin fit in this kind of category. As the technology is reaching a broader base of the public, investors and media are starting to get attracted. Money flows increase and prices begin to rise. Positive price developments attracts even more investors. Hype, greed and unrealistic expectations drive price levels upwards to new all-time highs. The bubble bursts! An initially small pushback leads to a mass sell-off from weak hands. It now becomes investments were made on the base of delusive expectations and how fragile the seemingly endless capital flow has come to an end. Many people have taken into account huge losses while the market capitalization reaches the bottom. Weak-hands were shaken out. Only people truly believing in the future of the technology are holding stakes. Adoption is starting to kick in! 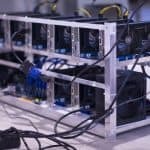 The surviving businesses have enhanced technology further, benefiting customers even more than before the crash and media is beginning to recognize the positive trend again. A phase of stability occurs where past market highs will look like a tiny outbreak in a long market history. Take note that professional investors are often doing exactly the opposite of the general public. Imagine the people having bought Bitcoin at nearly 20’000 USD. They have actually managed to get in at the worst possible entry point in the history of an asset. Make sure that you will not be one of them. Having a look back in the past days is often very helpful to understand market movements. Especially price movements of cryptocurrencies seem to be unpredictable and volatile but they normally run through certain patterns. No matter which asset class you are invested in, the psychology of human beings remains the same. History has shown that psychological factors have played a decisive role in market determination. Bull runs are more likely to happen if frequent media reports are pouring in. Media coverage is more a reaction than a trigger as they are one of the few instances noticing an increased demand for certain kinds of information. Reports are nothing more than a reaction to elevated demand from the masses. If we look at bear markets exactly the counterpart is the case. Media is determining the lack of interest because people do not want to get confronted with negative news. They will need time to restore confidence before aiming for higher targets again. 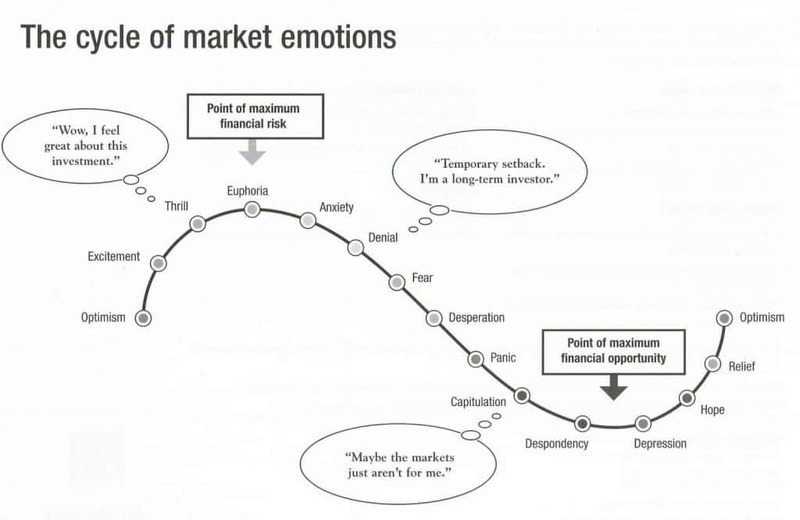 This means in effect that psychology ultimately explains the theory of market cycles. The cryptocurrency market is currently experiencing a period of stability. Bitcoin has remained relatively stable in price which might be a positive sign that confidence has getting restored and rock bottom has been hit. An uptrend is therefore likely to happen but when remains unclear. Another psychological phenomenon named chicken or egg paradox was already observable plenty of times. If a plurality of people are fearful and believe that a drop will soon occur, the drop is actually very likely to happen. Deep belief and fear of a majority inevitably result in a market correction or crash because minor price drops will end up in a mass sell-off as everyone is expecting the price to decrease further. The chicken or egg paradox is referring to self-fulfilling market prophecies. After you have gained an overview about economical aspects, we will now focus on the understanding and application of specific trading indicators used in Technical Analysis (TA). This will broaden your knowledge about how to trade and what price movements to look out for. Short- and long-term decision making will get simplified. Before diving into explanations you should make yourself familiar with candlesticks charts. Candlesticks are commonly used displays of trading charts, not only in Bitcoin but also stocks. The following paragraph will enhance your understanding of those kinds of price charts. The candlestick consists out of 2 main parts. 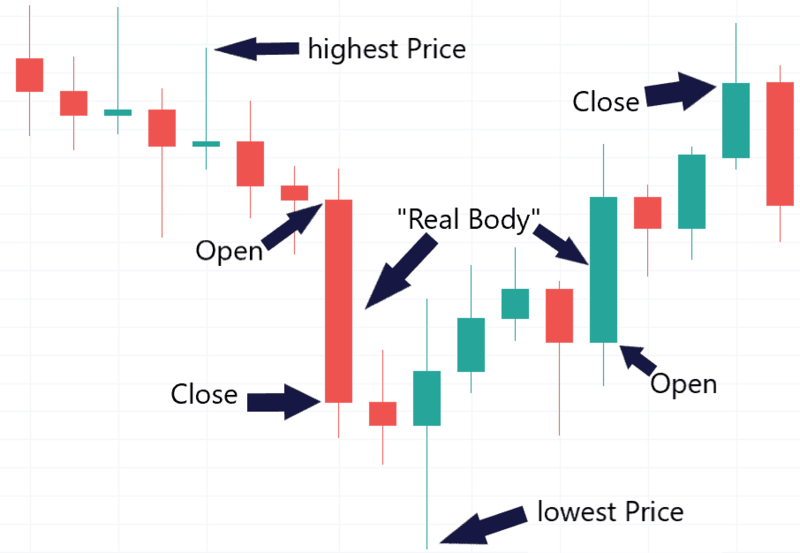 The sticks referring to the highest and the lowest price of the day and the body, also called “real body”, ranging from the closing price to the open price or vice versa. If the body of the candle is red, it signifies the closing price was lower than the opening price. Conversely, a green candle means that the closing price was higher than the opening price. Candlesticks charts are popular due to their intuitive form of presentation. An exact listing of all possible candlesticks patterns would go beyond the scope of this guide, but if needed make use of the PDF document down below. The Relative Strength Index is a commonly used metric indicating if a cryptocurrency is overbought or oversold. It can also be used to predict if a market is likely to reverse or not. Therefore it identifies potentially good entry and exit points. 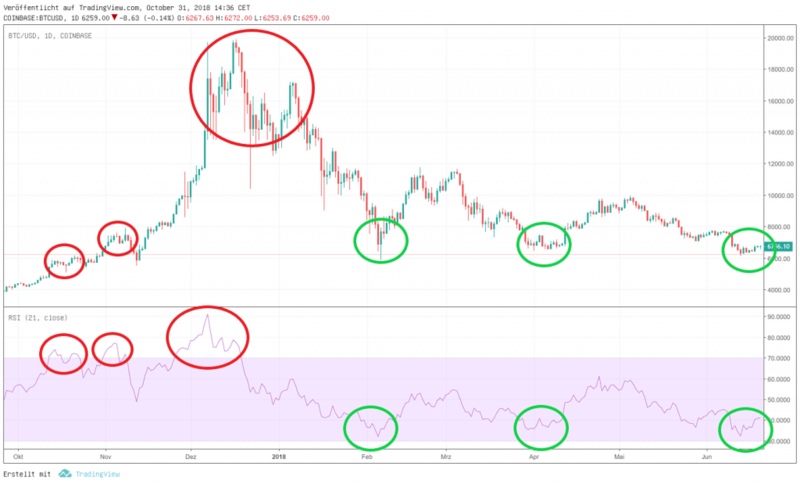 The RSI measures the past price movements and compares it to the current price movements. Moreover, it compares the magnitude of the current gains and losses to historical data in order to calculate the actual RSI. The Relative Strength Index ranges from 0 to 100. A RSI below 30% indicates overselling and a RSI above 70% indicates overbuying. 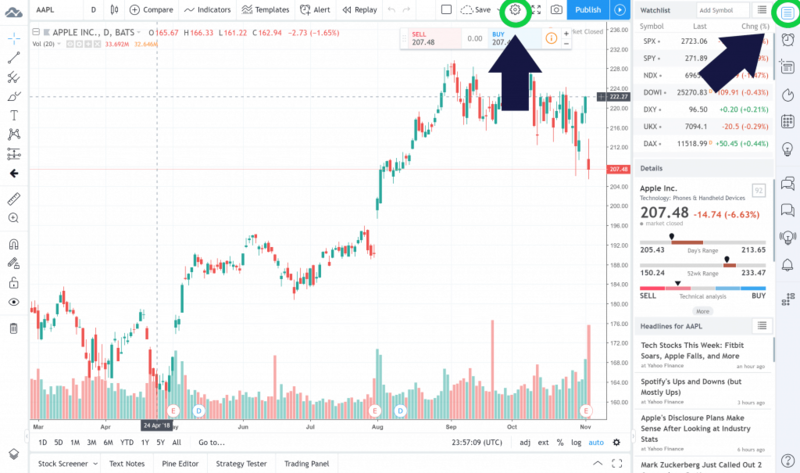 As an investor, you should be entering the market when the RSI is around or below 30% and take profits as soon as the Relative Strength Index has just passed or is near the 70% mark. In the picture above we have used the RSI 21. This signifies that it uses data from the past 21 days in order to calculate the RSI. The RSI 21 is more suitable for longterm holders whereas the RSI 14 is more useful for day traders due to its higher sensitivity. 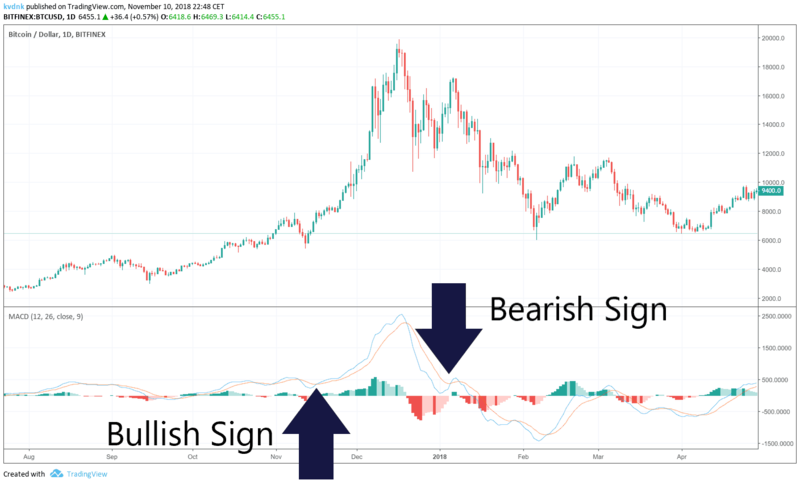 Over a long period of time, the RSI can be useful to spot market trends. The red circles indicate overbought situations characterized by high prices and therefore good exit points. The green circles show relatively low prices and therefore good entry points. 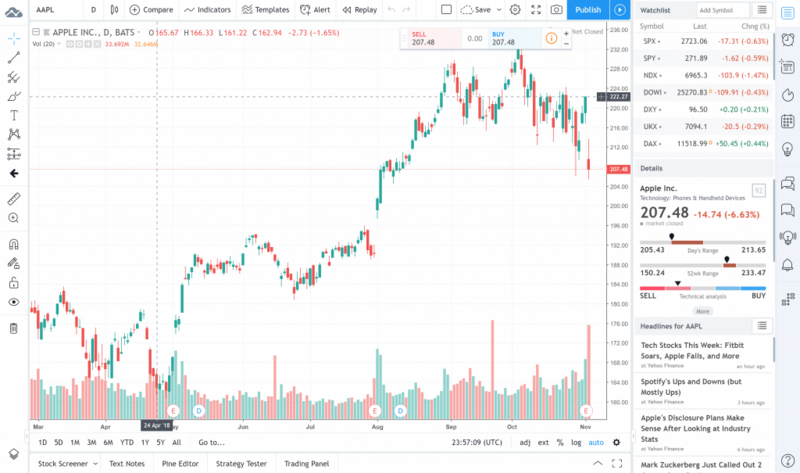 IS THE RSI LIMITED IN APPLICATIONS? The Relative Strength Index is a commonly used metric Yes, it can be. The Relative Strength Index must be treated with caution, especially during huge market swings like a rally to a new all-time-high or major correction phase. This is why you should always make use of other indicators simultaneously. What’s more, keep in mind that all metrics from Technical Analysis (TA) have to be considered with the current market sentiment. Simple Moving Averages are used to identify a trend direction, either bullish or bearish. This indicator determines resistance and support levels and is often utilized in combination with Exponential Moving Averages’. The SMA is calculated with closing prices for a certain number of time periods divided by the total number of time periods. E.g. the SMA 200 is based on 200 time periods whereas the SMA 50 is based on 50 time periods. General rule: The larger the number, the less reactive the SMA. The SMA 10 to 20 are often used by short-term traders. The SMA 50 is a good indicator for mid-term trends and the SMA 200 is the best for long-term trend views. Basically one can say that as long as the short-term averages are above the long-term averages the market remains bullish. As soon as the short-term averages are below the long-term averages it indicates a turn towards a bearish state. Short-term averages may show you levels of support when the course experienced pullbacks. The Bitcoin chart above shows the price movement from August 2016 to November 2016. 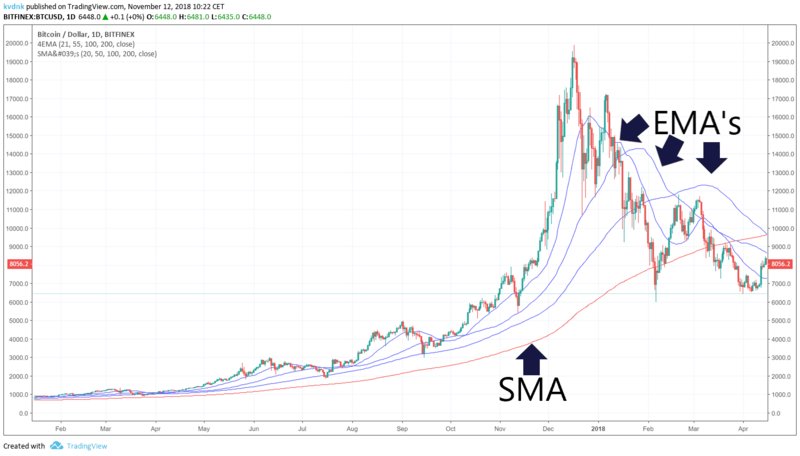 It is clearly visible that the SMA 100 and the SMA 50 acted as support levels of Bitcoin. The opposite is true as soon as the SMA hits resistance levels. As shown in the image below. 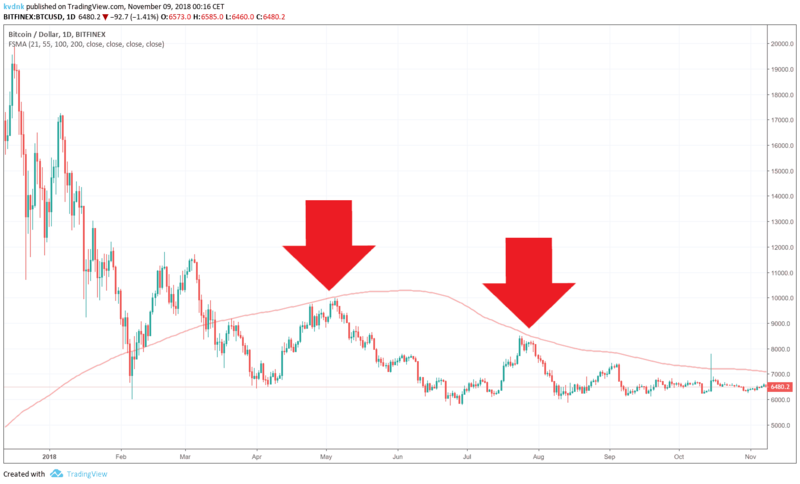 You can see where the simple moving average hits resistance levels from Bitcoin. Those have to be to overcome otherwise the market won’t turn into a bullish trend. The opposite case is shown in the graphic below. WHAT IS IT & HOW IS IT MEASURED? The Exponential Moving Average gives greater weight to recent prices. It is frequently used in combination with the SMA. The 21 EMA is matching for short-term averages and the 200-day EMA is more used to determine long-term trends. The commonly used EMA’s for trading cryptocurrencies are the EMA 21, EMA 55 and 100. 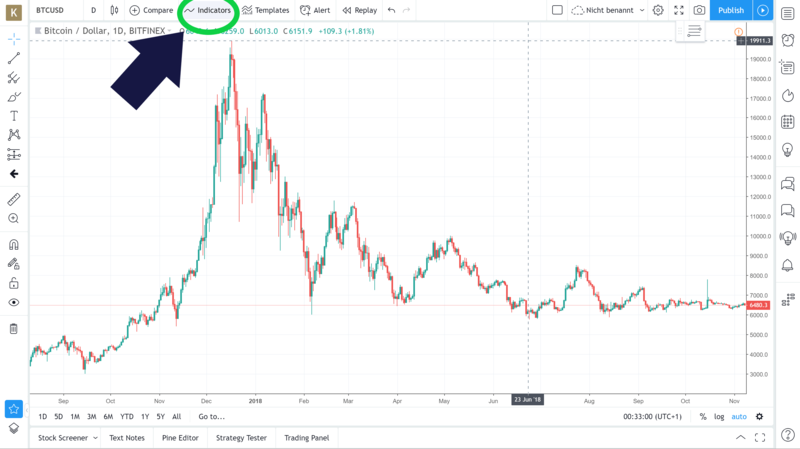 In the picture below there is another Bitcoin chart dating back to February 2017 until April 2018. On this occasion, we have used a combination of the SMA 200 and the EMA 100/55/21. Note that as long as the EMA’s are above the SMA 200, the market remains bullish. We record that even though the price massively tanked between February 2018 and April 2018, it has technically remained in a bullish state and could have broken out. Unfortunately, that was not the event as we all know. 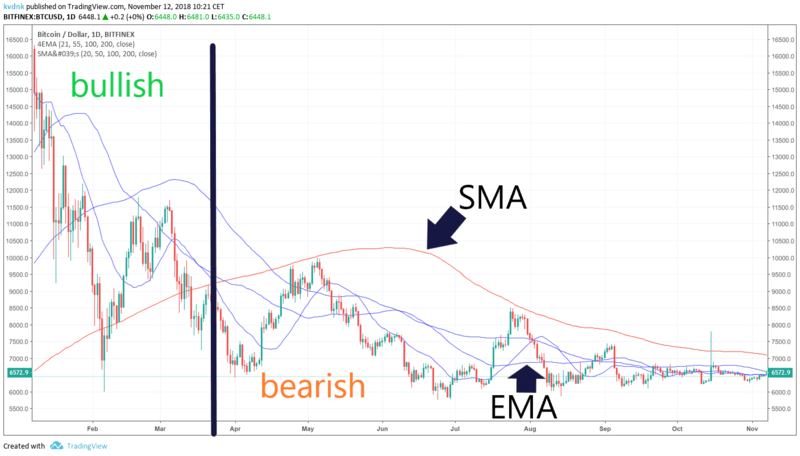 Consequently, if the EMA would fall below the SMA 200 line we “officially” enter a bear market state. Let’s have a look at the picture below. This is an extraction of the Bitcoin chart from February 2018 to November 2018. It is clearly visible that the SMA 200 is above the EMA’s. As long as this is the case we keep going on having a bearish trend. WHAT SHOULD YOU KEEP IN MIND ABOUT EMAS? Those averages are described as lagging indicators. This means that they are always lagging behind the actual market. Therefore they might not display accurate information for short- or mid-term trading stages but might definitely be suitable spotting for long-term entry points. 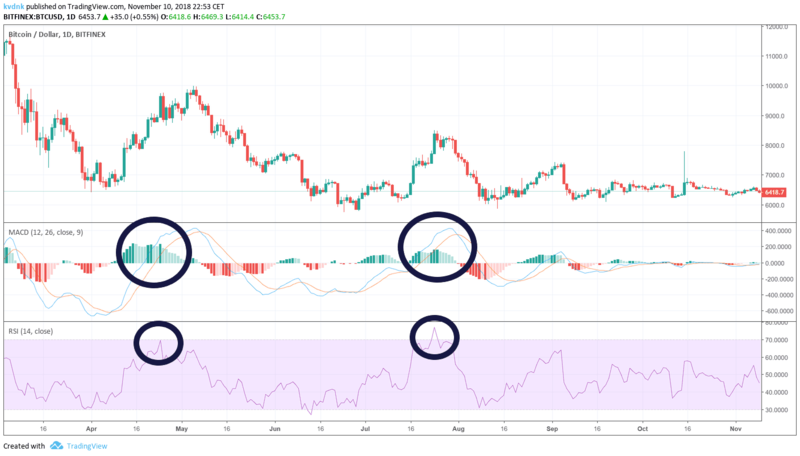 What is a Moving Average Convergence Divergence (MACD)? The Moving Average Convergence Divergence (MACD) indicator is one of the most popular tools in Technical Analysis. It is a trend following indicator and shows particular trend directions. 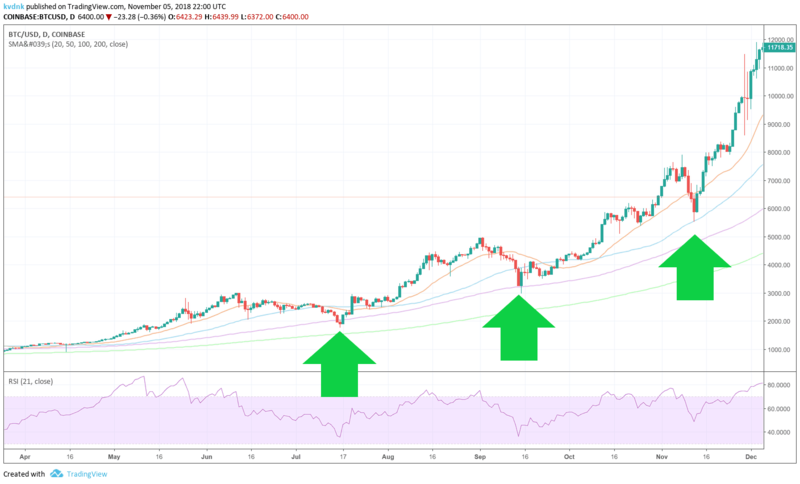 The correlation between two Moving Averages is calculated by subtracting the 26 EMA from the 12 EMA. The difference will get you the MACD line. In addition, a second trendline based on a 9-day Exponential Moving Average will be plotted on the chart. This line is named “signal line” and highly reactive in comparison to the original MACD line. Additionally, you get a histogram of the graphs, showing you the spread between the MACD and the signal line. The combination of all 3 tools enables an accurate estimation of the market momentum and indicates when it turns either in a bullish or a bearish state. Crossovers indicate a bullish or bearish trend signals. As shown in the picture below, as soon as the MACD falls below the signal line, it displays a bearish trend signal. On the opposite, in case the MACD is rising above the signal line it indicates a bullish sign. 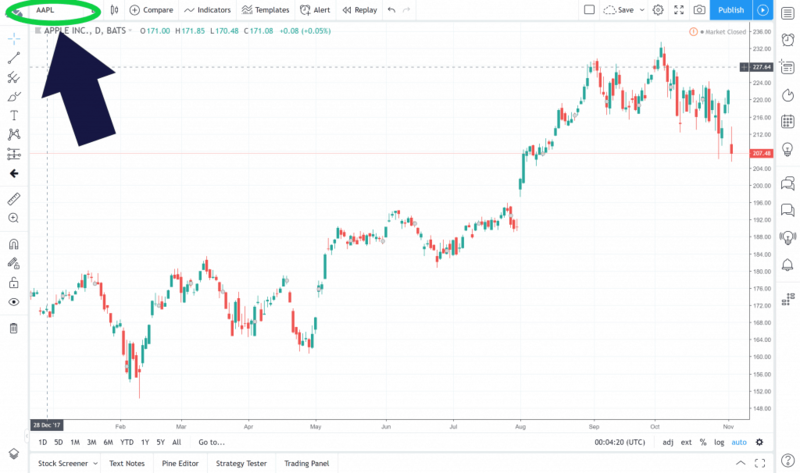 Those crossovers can be used in combination with other trading tools such as the Relative Strength Index, Fibonacci Retracement, SMAs, and EMAs. A divergence happens when the MACD forms highs or lows that separate themselves from the corresponding extremes on the price chart. A bullish divergence occurs when the MACD forms to rising lows while chart prices are forming falling lows. Vice versa, if new price highs form falling MACD highs it reflects a bearish trend. A rapid rise or fall occurs when the MACD line changes way faster in comparison to the signal line. This scenario determines an overbought or oversold situation. The additional use of the Relative Strength Index helps for trend confirmation. Some traders make extra use of the MACD histogram. It is basically applied exactly the same way as the MACD and can be used for additional trend confirmation. Like all tools of Technical Analysis, bear in mind to first make your own experiences before throwing in real money. At the end of this guide, we will give you some widening trading resources to acquire more intrinsic knowledge. The Fibonacci Retracement is a reliable long-term trading tool determining future trends. It has a distinct advantage applicable in different ways best fitting to your personal trading strategy. As short-term investors will drag the Fibonacci over a shorter period of time, long-term investors will choose a larger timeline. This metric is as well giving you information about key support and resistance levels. The mix with previously shown indicators in the name of SMA’s and EMA’s makes it even more powerful. Below you got another extract of a Bitcoin chart from February 2018 to May 2018. To apply the Fibonacci Retracement correctly, just drag it down from the bottom to the top of your price chart. If lines are not extending automatically adjust the settings of your trading tool. We are now able to see key support/resistance levels. The recent resistance level is a bit above 8’000 USD. If Bitcoin manages to go above the 61.8% mark it is more likely to rally to new all-time highs. Using the Fibonacci means that you should constantly use the same reference points meaning to either start on top or bottom of the candles. Another way would be to plot it from one candle body on top to the other body at the bottom. Either way, it is essential to apply it consistently. Correct use: It starts at the bottom of the candlesticks and ends at the candlesticks on top. Correct use: Fibonacci starts at the body from the bottom candle and ends at the body of the candle on top. False use: It starts at the candlesticks and ends on top of the body. False use: It starts at the candle's body and ends at the candlesticks on top. Use it for longer time periods. The Fibonacci indicates you long-term trends and market behavior. As a nice bonus, it will also be more accurate over longer periods than over short timeframes. Use it in combination with other trading metrics. Otherwise, It will probably lead into false assumptions. The risk of failure depends on the number of tools you are utilizing simultaneously as their mutual confirmation increase probability. All metrics presented have the potential to make your future trades more successful. In the following chapter, we gonna present you TradingView, a chart website able to integrate all indicators named above. In this section, you will learn how to integrate your trading skills into TradingView. We give you complete step-by-step guidance on how to adjust settings in order to use all previously examined trading metrics on your own. TradingView is a financial visualization platform with cutting-edge trading technology. Major trading platforms and exchanges have integrated TradingView to get faster trading signals as professional traders heavily rely on an accurate and instant display. 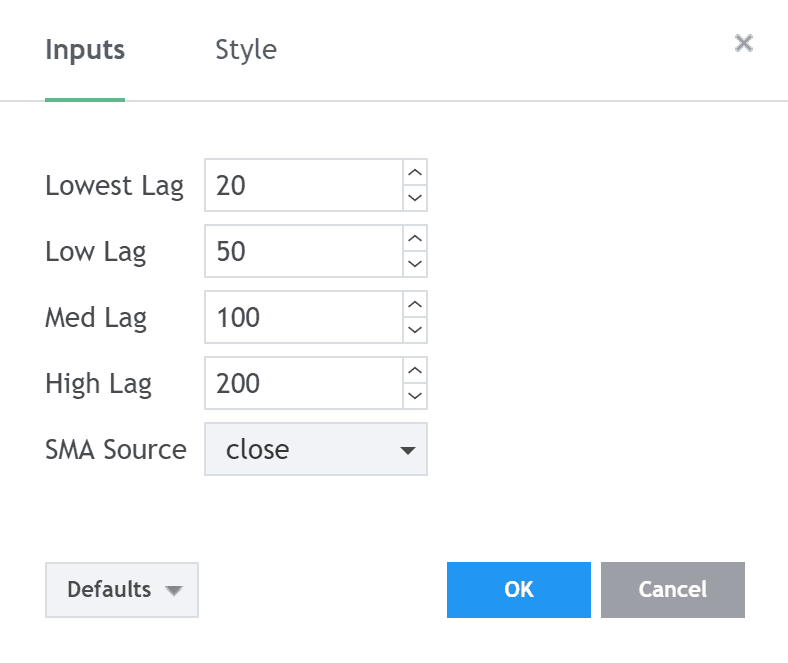 The following guide will explain how to adjust TradingView settings including the RSI, SMA, EMA. 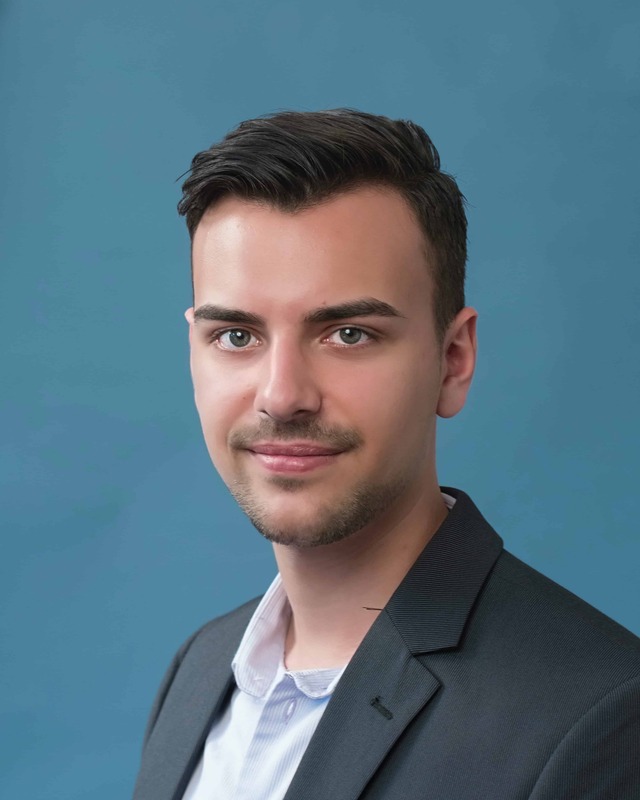 Go to TradingView.com. You can use the website right away for free. It will display a chart like below. The wealth of possibilities might appear deterrent to you but no worries, we will clean things up and give you a complete overview. In order to arrange and organize your trading chart, click on the „Watchlist, Details & News“ button in the top right-hand corner. Afterward, the sidebar will disappear. Then click in the top bar on the gear icon “Chart properties” to open a new window showing chart properties. Move to “Trading” tap and deactivate the “Show Buy/Sell Panel” option. Afterwards, click on the “Event & Alerts” tap and deactivate all options. Confirm with “OK”. Now, you should end up having a clean trading chart. But there is one more thing missing – exactly the trading tools! Type in the name of your cryptocurrency to find its chart. We have chosen a BTC / USD pair from Coinbase. You can alternatively choose trading pairs from Bitfinex. The price differences between different exchanges are small (under 1%). Now you are able to configure specific trading tools. Let’s get started! On the top bar are all indicators. Click on it. After that, use the search function to find your specific trading tool. 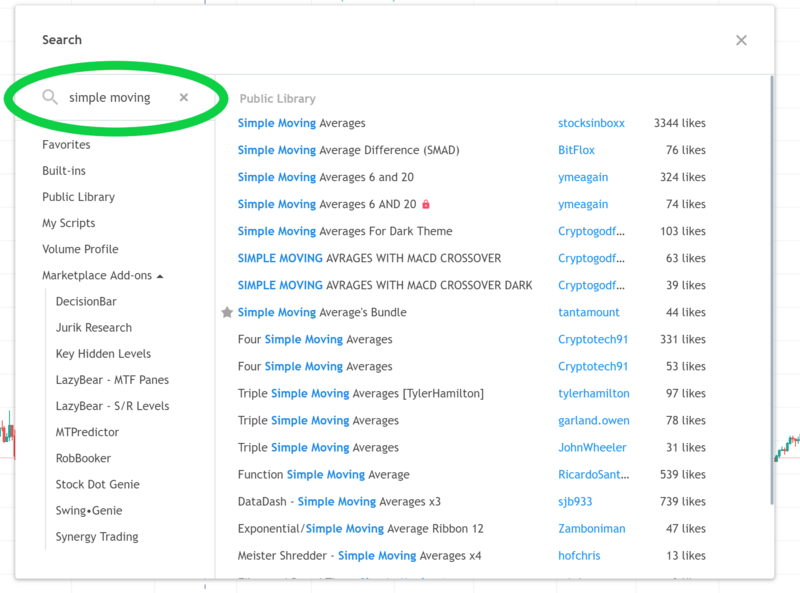 If you are looking for the SMA, type in the search bar “simple moving average” or “SMA” and you will get various suggestions. Now add the SMA to favorites in order to avoid any troubles finding it again in the future. After that, a window will pop-up allowing to choose preferred settings and the range or rather which SMAs should be displayed on the chart. 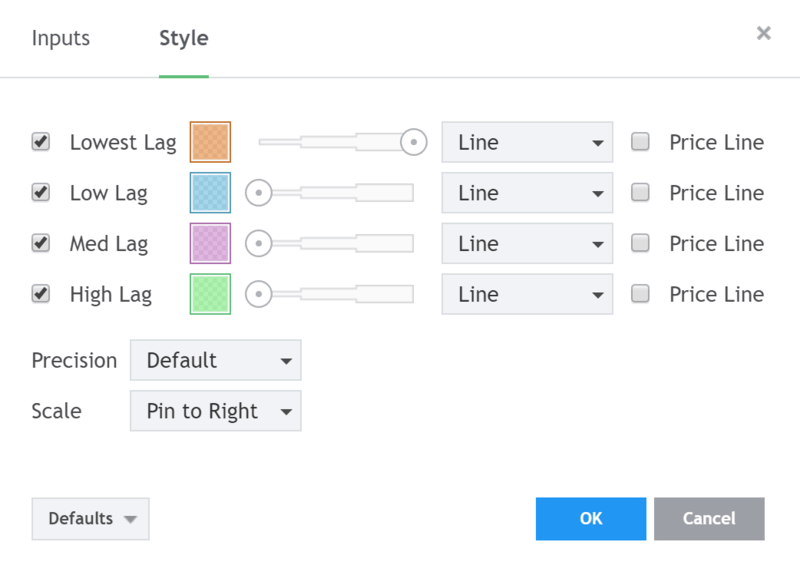 The menu point “style” enables the customized styling of your chart. This might be helpful when you are using multiple trading tools simultaneously as e.g. different colors improve the transparency. Add the end, if your chart looks like the one down below. Congratulations, you have finally made it and set up your own trading chart. Note that this guide applies to all trading metrics. Just type in the name, add it to your favorites and configure it like declared above. We hope that our Blog have enlarged your knowledge about cryptocurrency trading. It demonstrates that really everyone can master Technical Analysis with respective guidance. But like everywhere else, you have to practice now! This guide will not prevent you from making mistakes. In the most favourable case it will minimize them but mistakes are inevitable events necessary to gain experience and expertise. 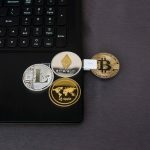 Just remind yourself that your future success in cryptocurrency trading will heavily depend on applying these tools correctly. For all trying to take the next step, we highly recommend the following trading guide of Toma Alexandru. He is a professional trader, sharing his personal experiences and expertise in almost 4 hours of video material. His course is excellent providing a complete overview of Technical Analysis.